The Seminole County Gun & Archery Association (SCGAA) is an organization operated by member-volunteers. 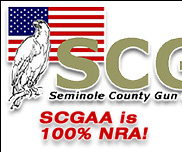 SCGAA’s shooting range is located in northeastern Seminole County. The facility features shooting ranges for rifle, competitive events, pistol, plinking, and archery. Safety is First: While we shoot for enjoyment and firearms practice, our club’s Safety Rules are the umbrella over everything that takes place at SCGAA. Below is a list of club rules, and all of our members (and guests they bring) are expected to know, understand, and follow these rules without question. Other ranges, hunt clubs, and similar facilities may have rules that vary from SCGAA rules. You should know that if you cannot familiarize yourself and follow the following rules, you should probably find another place to shoot…rules violations are not taken lightly. The club bases its General Safety Rules very closely on the shooting Range Rules published by the Education and Training Division of the National Rifle Association (NRA). The subsections below use the NRA guidelines as headings and information for each subject. 1.1 It is NEVER acceptable for any person to be swept by the muzzle of any firearm. 1.2 While on the firing lines, every firearm should at all times be pointed down range. If not loaded and chamber is open, it must be pointed up in the air while being transported from one area to another. 1.3 Every firearm should be brought to the firing line in a suitable case with the firearm unloaded. If a case is not available, the firearm must be brought to the firing line empty, carried with the muzzle pointed straight up in the air and the action locked or propped open. Flags are an option to use to indicate an open and empty action. 1.4 No firearm may be brought to the firing line if the firing line is in a Cold status. There are no exceptions to this rule. Firearms can only be brought onto the Range while Range is Hot. 2. Always Keep Your Finger OFF the Trigger Until You Are Ready to Fire. 2.1 It is the shooter’s responsibility to ensure that no negligent discharge occurs on Seminole County Gun and Archery Association (SCGAA) property. 3.1 All firearms must be brought to the range unloaded. All loading must be done on the firing line. All firearms must be unloaded before being removed from the firing line. 3.2 Whenever the firing line is declared Cold every firearm must be unloaded, its action open and it must be placed in a secure position on the bench or in a case or rack behind the firing line. No firearm, ammunition or firearm part (i.e. magazine) may be handled while the range is in a Cold status. 3.3 Every firearm left unattended on the firing line, especially when the range is Cold, must be unloaded, the chamber empty, magazine removed (if applicable) and the action open. 4.1 It is the shooter’s responsibility to ensure that every firearm and ammunition used on the range is maintained and used in a safe manner. 4.2 It is the shooter’s responsibility to ensure that only suitable ammunition is used in each firearm. 5.1 Only targets authorized for each range may be used on that range. It is the shooter’s responsibility to ensure that paper targets are being used and that they are secured to the club provided backboards. It is unacceptable to use any target material that could cause a ricochet. 5.2 Targets must be placed at a height to ensure that all bullets fired will impact the middle third of the berm. Aerial shots and ground shots will not be tolerated. 5.3 It is the shooter’s responsibility to line up with their target. No crossfire will be tolerated at any time. 6.1 At all times the range is in one of two states: Hot or Cold. 6.1.1 When the firing line is Hot, shooters are free to fire and no one may go forward of the firing line for any reason. 6.1.2 When the firing line is Cold, shooters are free to move forward of the firing line to work on targets and no one may handle any firearm, ammunition or firearm part (i.e. magazine.) This is the safe condition for the firing line. Members and/or guests who have not gone forward must remain behind the red line painted on the floor of the firing area. 6.2 It is the responsibility of every shooter (member or guest) to ensure that the firing line is not declared Hot until all others are behind the firing line. 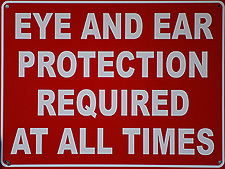 EVERYONE on the firing line shall wear Eye and Ear Protection when the Range is Hot. 6.3 It is the responsibility of every shooter (member or guest) to ensure that all others on the firing line are made aware when the firing line is declared Hot or Cold. 7.1 CEASE FIRE This is the command for all shooters to immediately stop firing. You do not have to make your firearm Safe. Once you hear the command Cease Fire, stop firing and repeat the command to ensure that other shooters hear the command. Following the command to Cease Fire, the range will either return to Hot or go Cold. line Hot by consensus of all shooters on the line. All shooters will be given time to complete target work. 8.1 Under no circumstances will alcohol, alcohol containers or drugs be permitted on club property. Shooters must not under any circumstances be under the influence of drugs or alcohol while on SCGAA property. 8.2 Shooters must also be aware of the effects of fatigue on shooter performance. Members are responsible to ensure that they and their guests are in a safe condition prior to coming to the range. 8.3 Shooting times on the ranges are from sunrise to sunset. 8.4 No tracers, incendiary, explosive or other projectiles carrying any form of active components will be permitted for use on SCGAA property. 8.5 All rounds must be fired from designated firing points as defined for each range. Special firing points may be established for particular authorized SCGAA matches or SCGAA sanctioned training purposes. 8.6 All shots will be fired from the concrete. No shots are to be fired from the grass area. 8.7 No shots will be fired from tactical positions. Firing from the prone position is allowed only on the Rifle Range and the 200 Meter Range. Firing from your back, side, or any other position is not allowed. 8.8 All rounds must be fired in a manner such that they strike the impact berms. Shooters should aim their shots to hit in the middle third of the berm to prevent ricochets. Rounds must not be fired into the ground or over the impact berms or over the sides of the berms. 8.9 No persons will be allowed on the impact berms or side berms of any range except for the purpose of authorized maintenance. Wind flags are to be placed on the ground near the firing line or at any other area on the ground between the shooter and the impact berm. Shooters will be permitted onto the footing of the impact berms of the Plinking Range only to place targets. Shooters may not under any circumstances be allowed on the berms of the Plinking Range. 8.10 Hunting will absolutely not be permitted on SCGAA property. to shoot and guests should be closely monitored, especially children. This rule may be modified at the discretion of the Board of Directors. 8.12 Guests of members must be directly supervised, one at a time, at all times while on SCGAA property and must not be shooting at the same time as the member. If the member is shooting, the guests cannot shoot and must be observing. If a guest is shooting, the member and other guests cannot shoot and must be observing. Only one shooter at a time will be allowed. Guests must not be allowed to handle firearms, ammunition or firearm parts (i.e. magazines) while someone else is shooting. Guests cannot be present on the firing line without close supervision of the host member. It is the sole responsibility of the member to ensure safe behavior of their guests. 8.13 Children under the age of 18 must AT ALL TIMES be supervised while on SCGAA property. Minors must be directly, immediately and continuously supervised by an adult while the youth is in possession of a firearm. It is strongly recommended that the member take the minor to the backboards when working on targets. This will rule out the possibility that the minor may handle a firearm while the member is downrange. 8.14 Pets must be controlled while on Club property. No pet shall be allowed to run freely so as to disturb other shooters. No pets are allowed on public day except Service Animals. 8.15 No one is allowed to be in the retention pond for any reason other than Authorized Personnel. 8.16 Vehicles must be operated in a safe manner on the property. Speeds must not exceed 15 miles per hour on the entire club property. 8.17 Shooters are required to clean up all trash and brass generated by their activities on club property and dispose of same in club provided containers. 8.18 No visible holstered firearms are allowed on SCGAA property at any time except on Public Day and then for Range Safety Officers (RSO’s) only. Members with concealed firearm permits who choose to carry firearms in holsters that are not visible may do so. SCGAA may decide to sponsor competition that requires competitors to draw handguns from holsters. This will be done at the discretion of the Board of Directors and will be the only time that drawing from a holster will be allowed on SCGAA property. 8.19 It is the responsibility of all members to monitor the SCGAA web site on a regular basis. Updates to Regulations will be posted on the web site and it will be the member’s responsibility to comply with new updates. It is the member’s responsibility to update SCGAA with changes in their address via the web site. 8.20 No political targets will be allowed. No member will be allowed to post a photograph or likeness of a political figure as a target. The same goes for the photograph of an ex-significant partner. These targets will reflect poorly on SCGAA and may be used against the Association. member who brings such a person to the range will jeopardize his/her right to access the property. 8.22 Brass belongs to the shooter. Any brass in the buckets may be taken by members for the purpose of reloading only. No brass not originally belonging to the shooter shall be removed from SCGAA property for the purpose of re-sale. 8.23 There will be no use of SCGAA property for the purpose of profiteering. There will be no training on SCGAA property for which a fee is charged. 8.24 Quick Draw, Cowboy Style firing is prohibited at SCGAA. Offenders will face disciplinary action. No shooting from a holster is allowed. 9.1.1 Firearms are permitted only during formal training with a designated Range Safety Officer present. 9.1.2 Certified NRA Instructors, Youth groups, ROTC groups, Police Explorers, etc. are authorized to use this range after meeting the scheduling requirements and being accepted by the Board of Directors (BOD) of SCGAA. 9.1.3 The Special Use Range is used for Orientation and is also used for Competition that is sanctioned by SCGAA. No Exceptions. 9.2.1 All shots must be fired into the berm. Ground shots will not be tolerated. Allowing any shots to exceed the top height of the berm is strictly prohibited. 9.2.2 It is the shooter’s responsibility to furnish all targets. It is the shooter’s responsibility to ensure targets being used are not of a material which might promote or generate ricochets. This includes but is not limited to: glass, hard plastic, metal, ceramic, masonry, appliances, computer parts, car parts, butane bottles, aerosol cans, paint cans or hazardous material of any kind. Nearly everything is prohibited except aluminum soda cans, plastic soda or water bottles and biodegradable clay pigeons. It is the shooter’s responsibility to police their shooting area and target area immediately after use of this range. 9.2.3 Targets may be placed on the crossties in front of the berm. You may toss your clays on the face of the berm. 9.2.4 Shotguns may be patterned or shot on either side of the Plinking Range with shot shell or slugs. Shooters must furnish their own stands. All pellets & projectiles must impact the berm at all times when firing. 9.2.5 Shooter-supplied wooden target stands may be short placed in front of the berms, however, they must be at the correct height to ensure all projectiles will impact the middle third of the berm. No ground shots or high shots will be tolerated. Paper targets only when this approach is used. The use of portable club stands as target stands is not permitted on this range. It is the shooter’s responsibility to furnish their own targets. 9.2.6 The Plinking Range is the ONLY Range where Class III fully automatic fire, short barrel rifles (SBR) and suppressors are permitted, however, Class III firearms will not be allowed on Public Day until 2:00 pm. 9.3.1 Paper targets only. Targets must be placed on the club provided backboards only. It is not permitted to place a target on or shoot at the uprights of the backboards. Pistol Range is intended for conventional pistol shooting including both center-fire and rim-fire cartridges. 9.3.3 Center-fire rifle and shotgun shooting are permitted on the left side only at 25 and 50 yards for initial sighting-in purposes only. Rim-fire rifles are allowed at the 25 and 50 yard distances. 9.3.4 Short barrel rifles (SBR) and suppressors are allowed on the Pistol Range however not on Public Day until 2:00 PM. 9.4.1 This Range is often used for Competition Matches. The Director of the match scheduled will be in charge of the 200 Meter Range during the match. 9.4.2 No member or anyone else can utilize this Range during the function of a Match. Once the Match is over, this range may be used by members. Members may use this Range if they furnish their own Silhouette Targets. SCGAA does not loan any of the Competition Targets to anyone. 9.4.3 Absolutely no armor piercing rounds to be fired at the metal targets. 9.4.4 This range is designed for center-fire and rim-fire rifles for the members when there is no Match in progress. 9.4.5 Silhouette targets must be placed at club-approved points only. All shots must impact the berms. No exceptions. 9.4.6 Provided that they do not interfere with silhouette shooting activities, rim-fire rifle shooting is allowed on this Range. 9.4.7 Center-fire rifles are permitted on this range for use of the 200 meter backboards and Berms as well as the metal targets that are hung on the 200 meter section of this Range. 9.4.8 Short barrel rifles (SBR) and suppressors are allowed on the 200 Meter Range however not on Public Day until 2:00 PM. 9.5.1 Center fire rifles are permitted on this range. 9.5.2 Rim-fire rifles, hunting and silhouette handguns permitted at 100 yards only. 9.5.3 Paper targets only. Targets must be placed on the club provided backboards only. Do not place targets on or shoot at the uprights. Gongs are specifically for Club Members only and are not to be used on Public Day. 9.5.4 Shooters are limited to slow fire aimed shots only. 9.5.5 Rapid fire and full auto fire is not allowed on this Range. 9.5.6 Shooters are allowed to drive a vehicle down range to change out targets only when the range is in a Cold status. 9.5.7 Absolutely no armor piercing rounds to be fired at the metal targets. 9.5.8 Short barrel rifles (SBR) and suppressors are allowed on the Rifle Range however not on Public Day until 2:00 PM. 9.6.1 No Damascus barrels are to be used on SCGAA property. 9.7.1 All range rules and range commands for firearms apply to the Archery Range. 9.7.2 No firearms of any type permitted at the Archery Range. 9.7.3 Do not stand at any place other than the firing line at the Archery Range. 9.7.4 Stay out of the Restricted Area at the Archery Range. 9.7.5 Targets must not exceed 3 feet above ground level. 9.7.6 No tree stands. Do not climb trees. 9.7.7 Only Field points may be used on this range. Broad heads (hunting arrow points) are prohibited. 9.7.8 For 3D Target shooting, please try to preserve the clubs targets. 9.7.9 Place all 3-D targets towards the North. 9.7.10 All personnel must enter and exit the 3-D area ONLY when there is no one else shooting. 10.1 Public shooting starts at 8:00 AM and ends at 1:00 PM on the first Sunday of each month. Unless you have a membership badge in full view or you are the signed-in guest of a member, you must leave promptly at closing. 10.2 Holstered firearms are prohibited by the general public on SCGAA property. 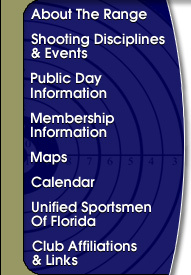 RSO’s and Seminole County Deputies are the ONLY ones allowed to have a sidearm on SCGAA property. Note: Any confusion or questions regarding the individual range rules can be directed to any Range Official or Board of Director (BOD) Member. can be directed to any Range Official.